Approximate unit locations are shown on the left map (in red) . The map on the right shows other significant locations (in blue) with the red marks for the unit locations. First Assault, May 19, 1863. After making a quick reconnaissance of the defenses, Gen. Grant ordered an assault on Vicksburg. It was made by Sherman's corps astride the Graveyard Road northeast of the city. Early in the morning, Union artillery began bombarding the Confederates with solid shot and shell. At approximately 2:00 p.m., Sherman's troops (General Francis P. Blair, Jr.'s Division) attacked Stockade Redan , a Confederate fort which guarded the Graveyard Road, and were repulsed with losses numbering about 1,000. Second Assault, May 22, 1863. After a more thorough reconnaissance Gen. Grant ordered another assault. 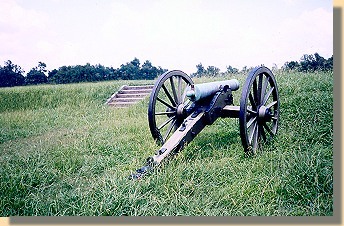 Early on the morning of May 22, Union artillery again opened fire against the city's defenses. At 10:00 a.m. Union infantry attacked along a three-mile front. Sherman, again, attacked down the Graveyard Road but this time McPherson attacked along Jackson Road and McClernand attacked along the Southern Railroad of Mississippi. All three corps made progress against the Confederate's fortifications, with McClernand's men briefly penetrating the Railroad Redoubt and Sherman troops temporarily planting a flag on the exterior slope of Stockade Redan. 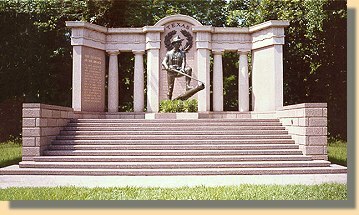 However, at each of the assault locations the Federals were again driven back with a total loss of more than 3,000 men. 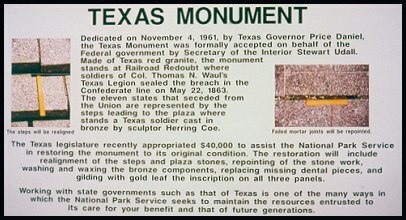 The Texas Monument is being renovated.